This AussiE-Update is dedicated to Sheila Dolan. 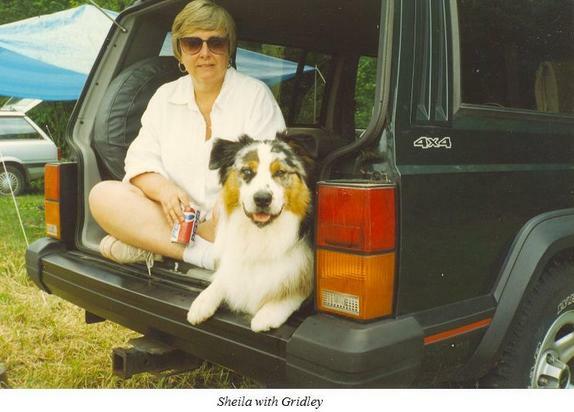 Kathy Glaes is putting together a two page memorial ad for both the Australian Shepherd Journal and Aussie Times in Sheila’s memory. Any funds in excess of the cost of the ads will be split equally among the USASF, ASCA Foundation, Toby’s Foundation and ASHGI. All monies must be received by Kathy Glaes no later then November 10, 2010. We hope you will support this initiative to honor Sheila’s life and memory. Please see the information below from Kathy Glaes. I am putting together a two-page memorial ad for both the Australian Shepherd Journal and the Aussie Times to honor Sheila’s contributions to and impact on the Aussie community. Sheila was committed to Aussie health and Aussie rescue. She believed strongly in the versatility of the Australian Shepherd and helped train her dogs to go from the conformation ring into the obedience, agility, herding and rally rings. Had her health been better, she would have been out there tracking as well. If you are interested in contributing to this ad, please send your contribution (whatever amount you are comfortable with) to me, along with how you want your name/kennel listed. All money left over from paying for the ads will be split equally among United States Australian Shepherd Foundation, ASCA Foundation, Toby’s Foundation and ASHGI. Your money must be in my hands no later than November 10 or you will not be listed in the ad. Promises of money on the way don’t count. Names will appear in both publications. I will not split names for only one or the other. Checks: Make checks payable to “Kathleen Glaes” and note in the memo area “Sheila ad”. Mail to me at Kathy Glaes, 1215 Cross Keys Rd, Reading PA 19605. Enclose a note to let me know how you want to be listed. Credit card: Accepted through paypal.com to KLGLAES@mac.com (you can type it all lower case—I just want you to see there are 2 Ls in the address). Put a note in the “message to recipient” box that it is for the Sheila ad and include how you want to be listed. PLEASE FORWARD THIS TO YOUR CLUB LISTS AND ANY FRIENDS YOU KNOW WHO MAY WANT TO TAKE PART IN THIS. Email me if you have any questions. Thanks!